Behind the Lace Curtains-Friday Fun Day, Let’s Picnic! I love picnics! When I was a child, my mother would fry up some chicken, make potato salad and get some chips and pop, and Dad would take us to the beautiful Bear Paw Mountains so he could fish and we could enjoy a picnic. Those were wonderful childhood memories, but I never lost my love for picnics. Nowadays, Jamey and I still go to the Bear Paws, but we also picnic at home. Why not? We have a nice lawn, both front and back yards, so might as well enjoy it. And yes, I pack a picnic basket! Whether it is a small snack or a full meal, I get out one of several picnic baskets, put everything into it and enjoy! One basket is perfect for a couple of bottles of wine and some crusty bread and spreads, another is complete with a set of dishes, flatware and glasses. One is so small, it is perfect for a sandwich, bag of chips and can of pop. 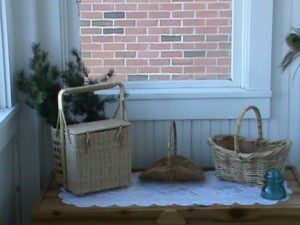 The basket on the left is for two bottles of wine and loaf of crusty bread and spreads. The one on the right I use to gather garden produce or pack a light picnic. The middle one is perfect for cut flowers, but not good for picnics!